The 10GBase-SR SFP+ transceivers are from Fiberstore, specifically Item No. 11589. I also have two (2) of their 1m LC to LC OM4 optical fiber cables. They work very well for connecting the NAS and virtualization server to the switch. I replaced the passive northbridge cooler on the mainboard with an active heatsink. 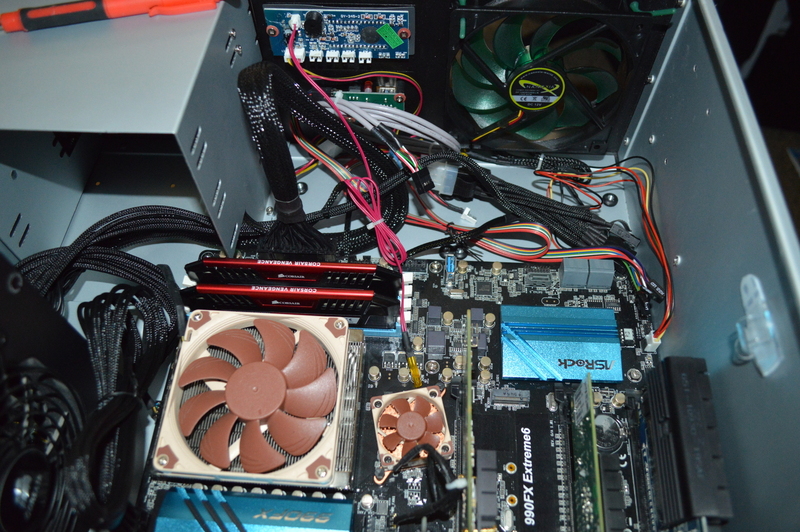 All PCI-Express activity goes through the 990FX northbridge, and it can get very hot as a result. As this will have a lot more PCI-Express activity than normal, it’s for the best. This isn’t it’s final form. But it’s close. 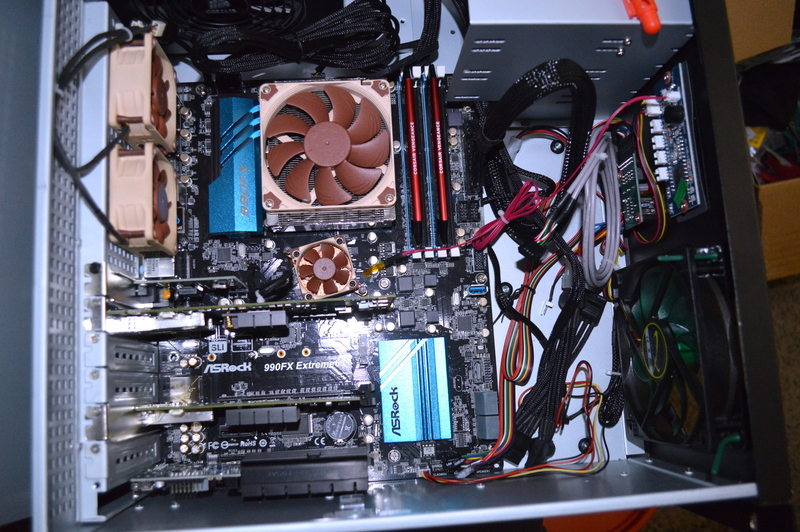 I relied on what I had at hand readily to build it, explaining why I used two Corsair SP120s initially for case fans along with the AX860. Stand in the same room and it sounded like bees swarming nearby. So I searched for quiet fans. I learned of the Nanoxia fans through QuietPC.com. 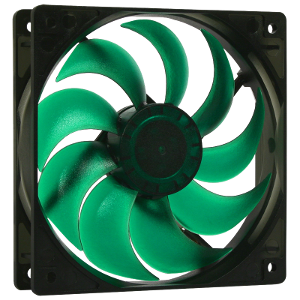 Sorting the list of their 120mm fans by noise, the Nanoxia Deep Silence 120mm fan stood out as the quietest fan giving 60 CFM (102 cmh), the “standard” 120mm airflow. The quieter fans on the list fall woefully short. Not a huge fan of the green color, but they are very quiet fans. My NAS has two 120mm intake fans on the back of the HDD bays, so I may consider swapping those out for these fans. Along with considering them for my wife’s system and my radiator box. The power supply will eventually be downgraded as well. An 860W Platinum PSU is overkill for this. And again I’m relying on Fedora 24 for this currently with the latest supported Mellanox EN driver. They still are not supporting Fedora 25 as of when this gets published, and their support for CentOS gives me reason to believe they never will. So that’s it for the Zone 1 switch. The Zone 2 switch will be coming shortly now that some of the hardware is on the way or already here.